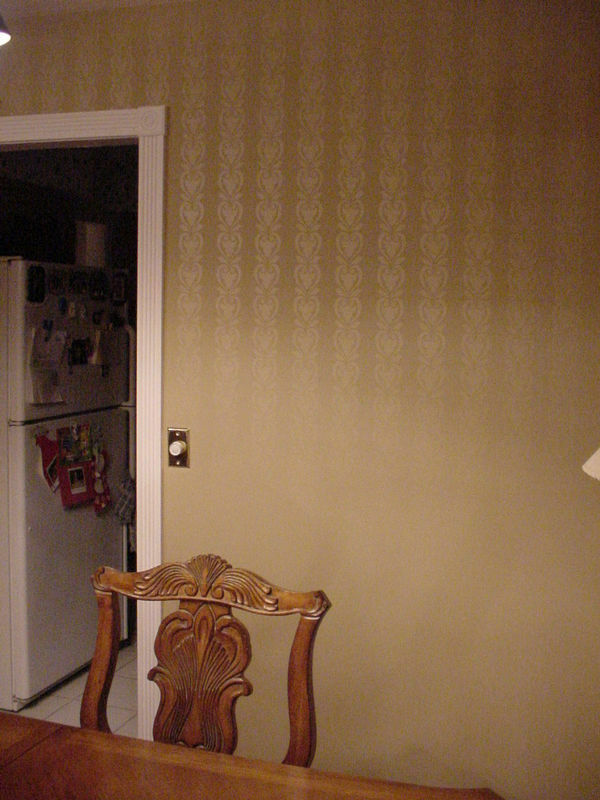 Dining Room displaying a faux wallpaper finish completed by only using a simple paint technique. 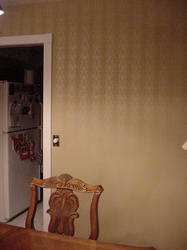 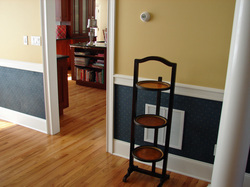 Detail of simulated wallpaper finish. 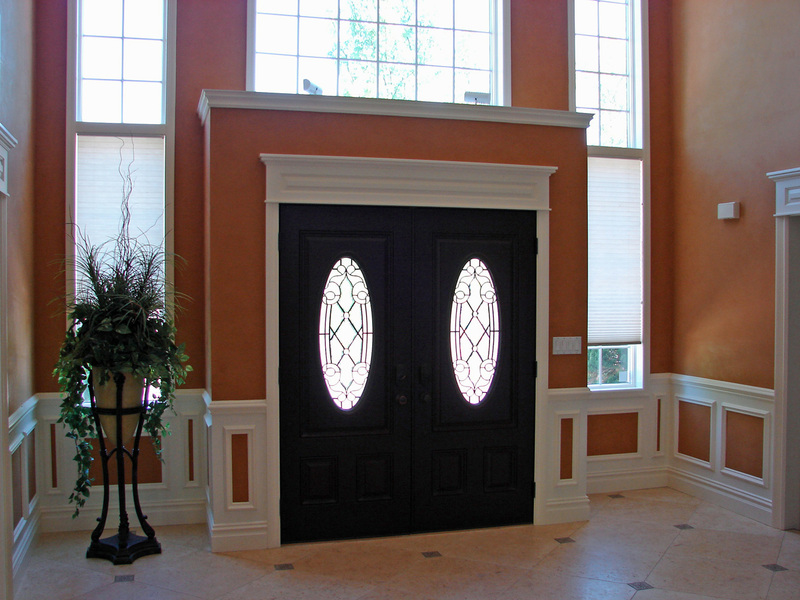 A Tuscan feel can be achieved as seen in this large Entryway finished in a beautiful Camel colored Venetian Plaster and accented with magnificent white painted wainscotting and moldings. 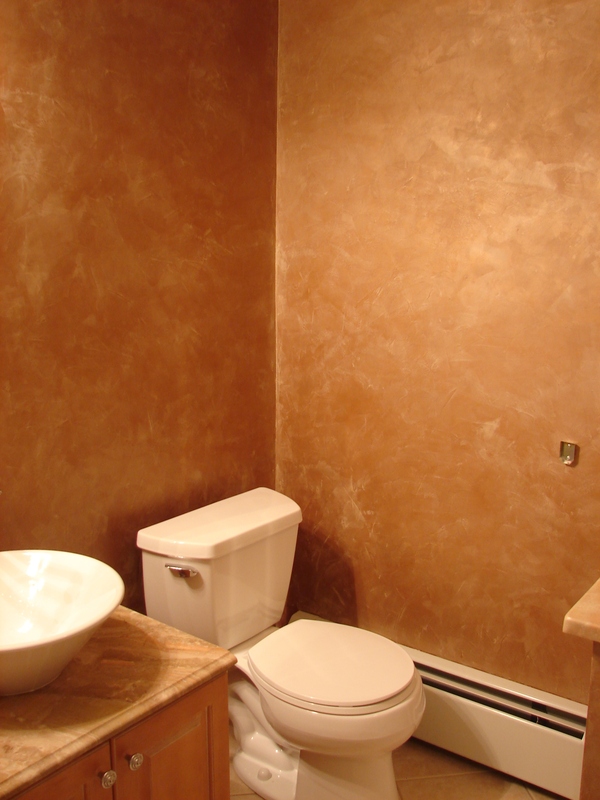 Venetian Plaster finish, detail view. 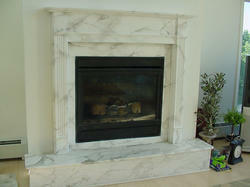 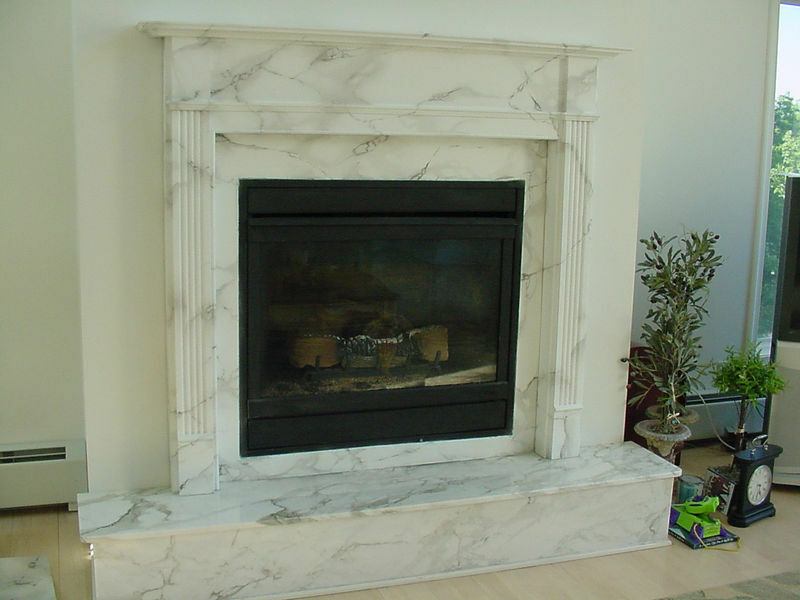 A faux Carrara Marble fireplace realistically accomplished. Close up view of faux marble fireplace. 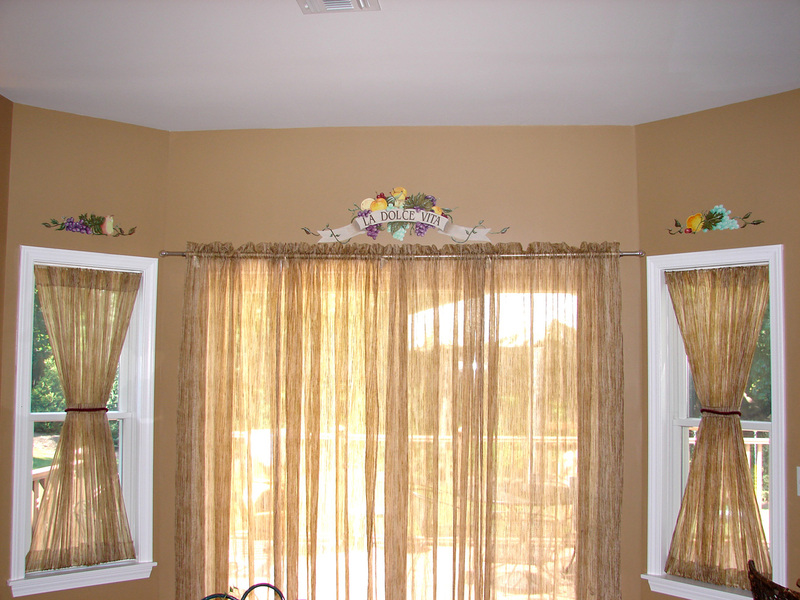 Can you guess which parts are real and which are faux? 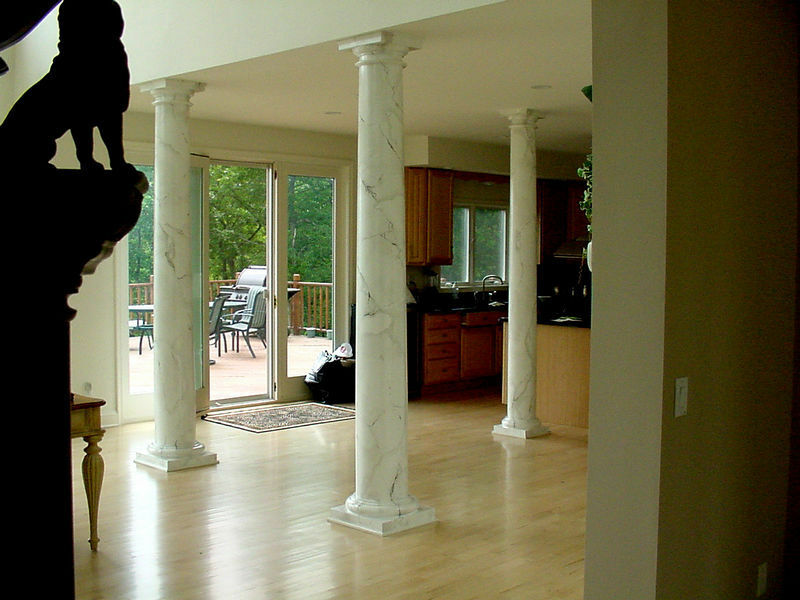 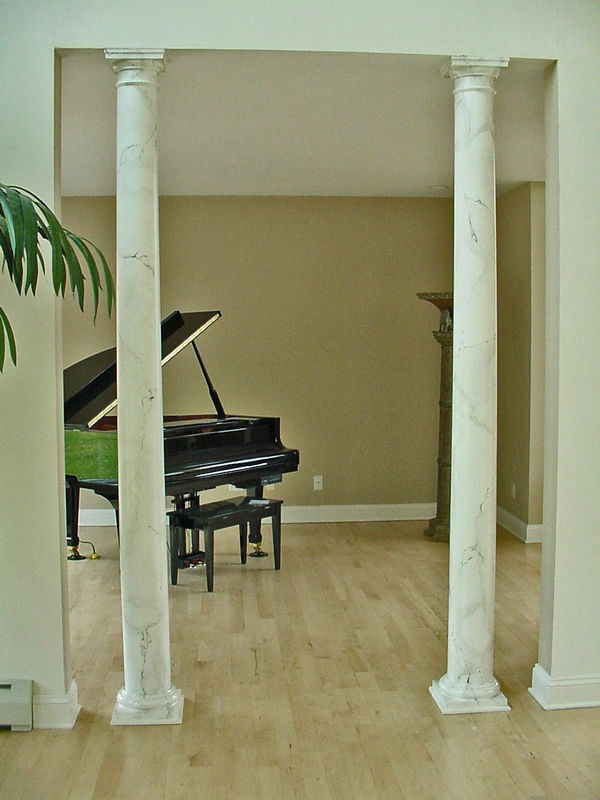 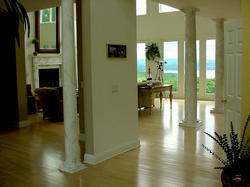 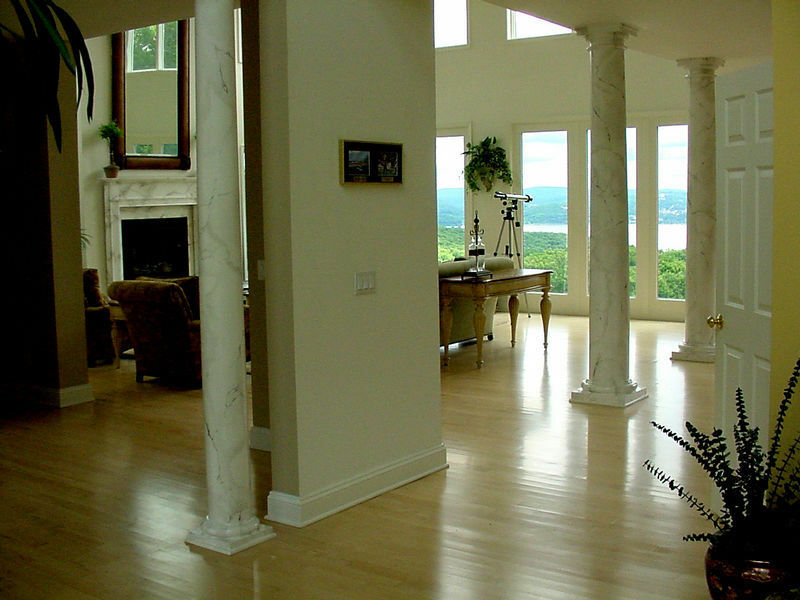 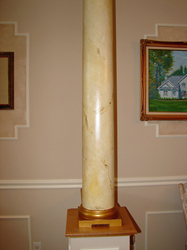 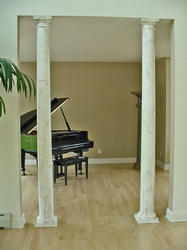 The columns were faux finished in a White Carrara Marble to match the existing fireplace shown in the background. 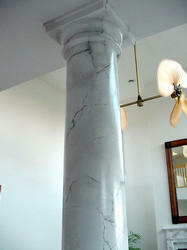 Another view showing the faux finished columns. Detailed view of the marblized columns. 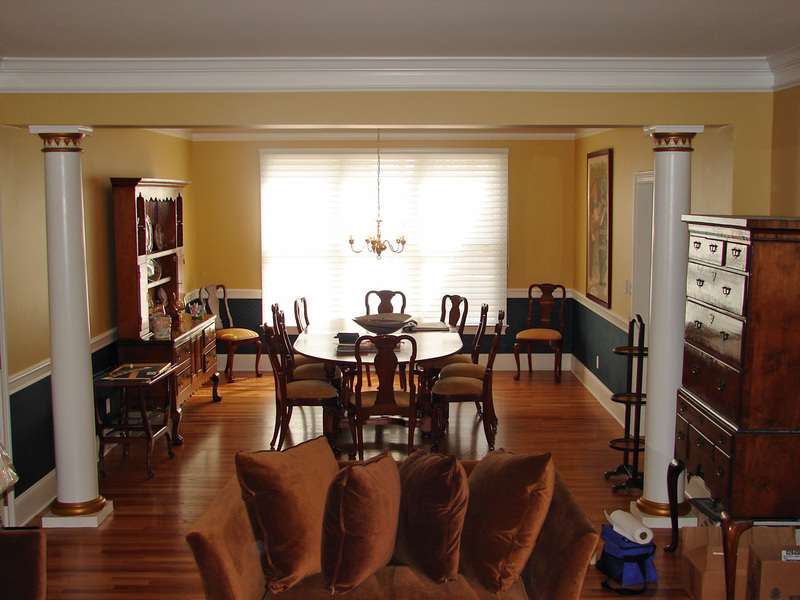 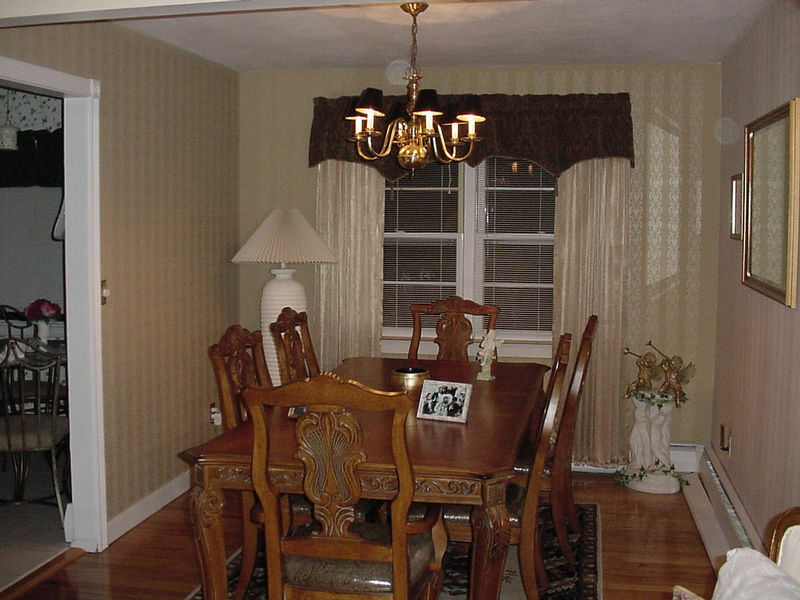 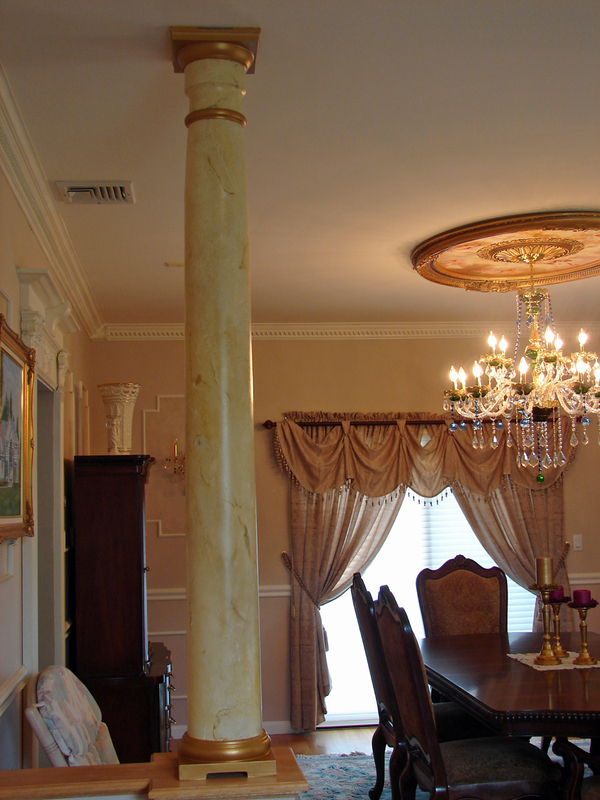 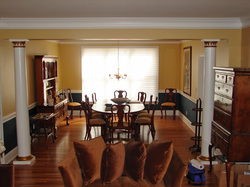 Sienna Marblized columns separate this Dining room/Living room combo. Accentuated by gold painted capitals and base. 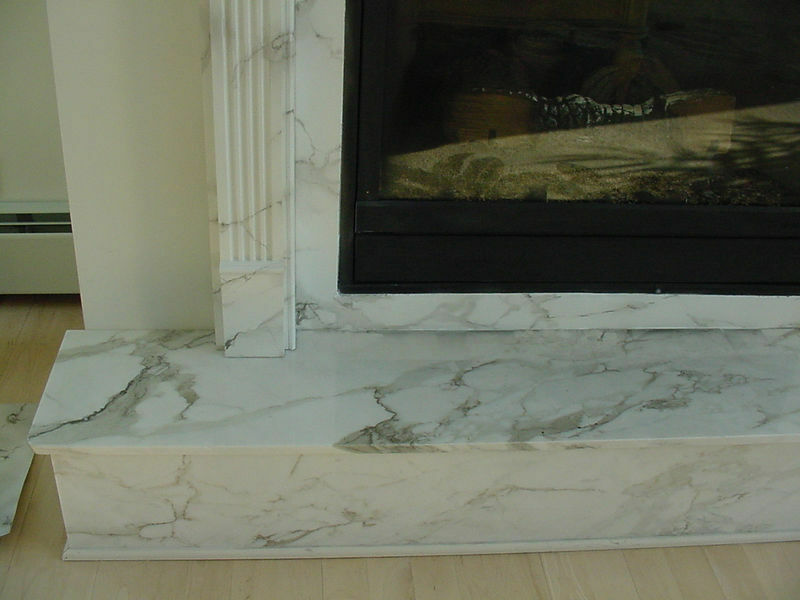 Detail showing the multi layered technique that is used to create the Sienna Marble finish. 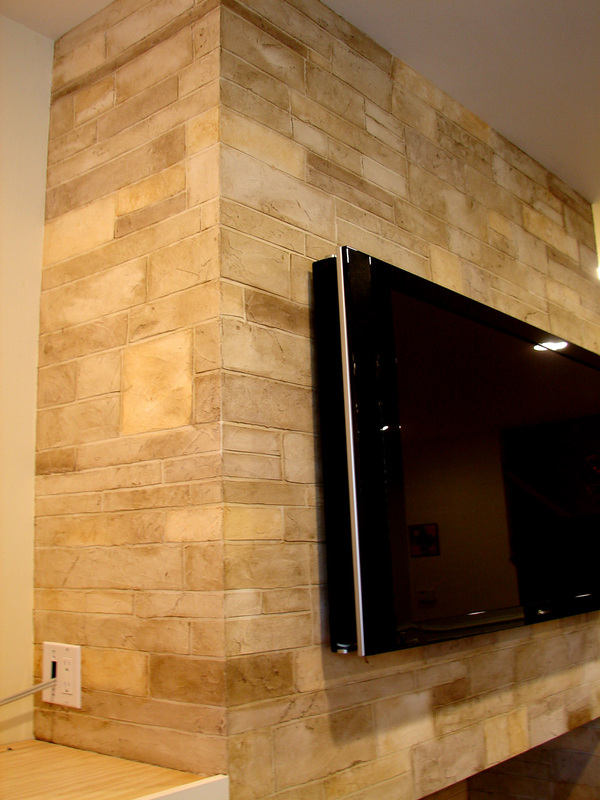 Stone work was custom color glazed to match the rooms decor. 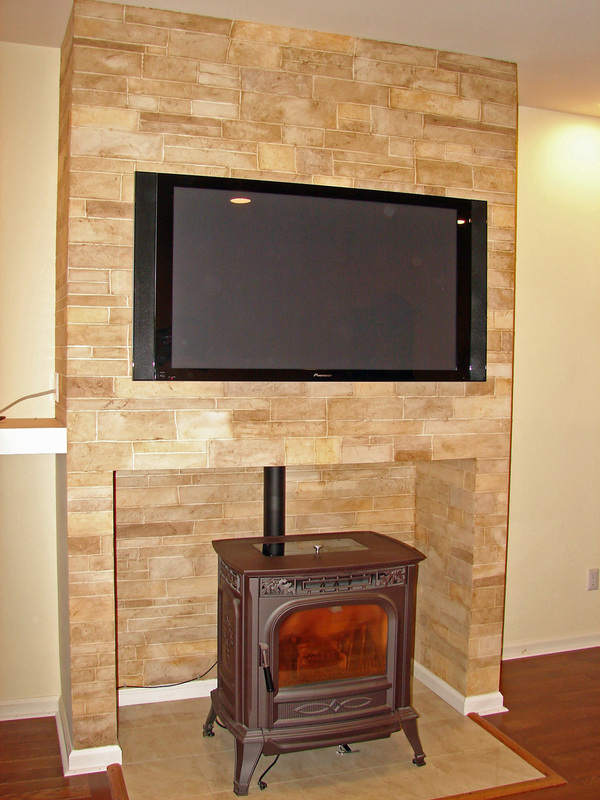 The bump out and housing to this wood burning stove was created to look like real stone. 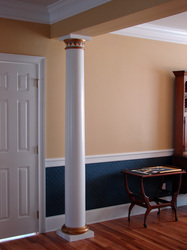 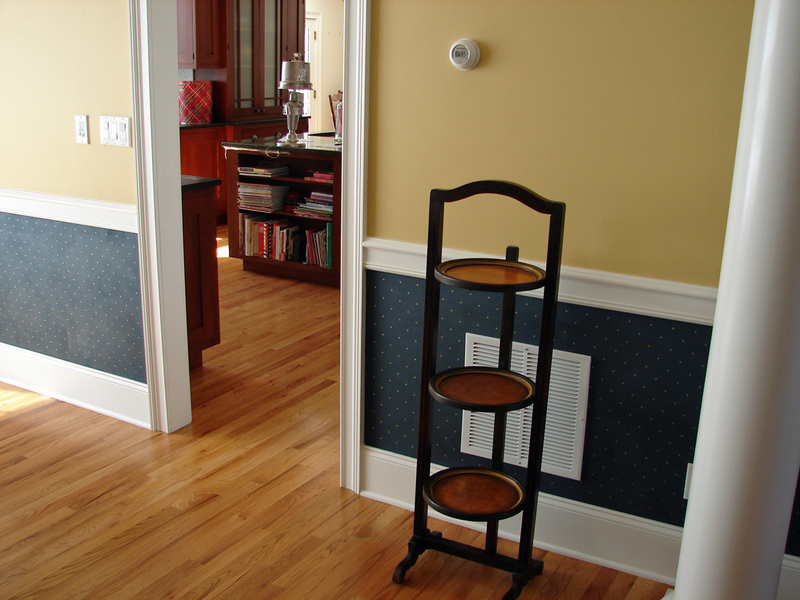 An elegant Dining Room shown with a warm golden yellow paint and a midnight blue Lusterstone, showing a custom painted polka dot pattern and one-of-a-kind ornamental detailing on the accent columns. 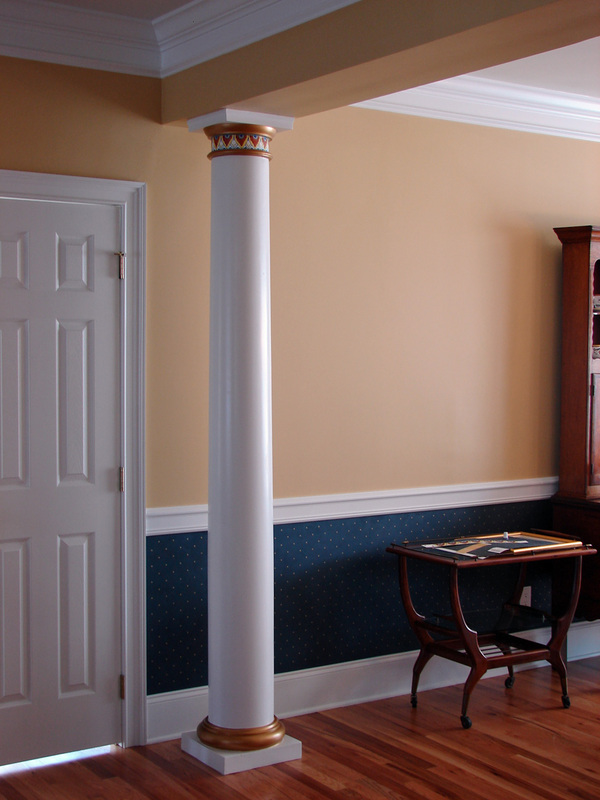 Closer view of walls and columns. 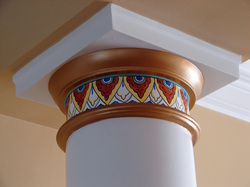 Detailed view of intricately painted columns. 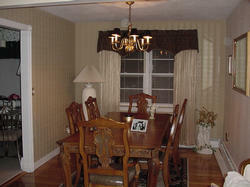 Inspiration came from patterns found on the clients hand painted china and dinnerware. 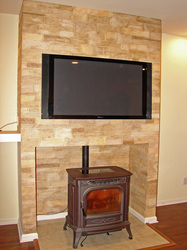 Detailed view of midnight blue Lusterstone with specially hand painted gold polka dot pattern. 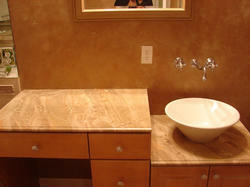 A warm Brown and Champange Gold colored Lusterstone in a Master Bath area. 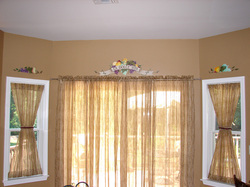 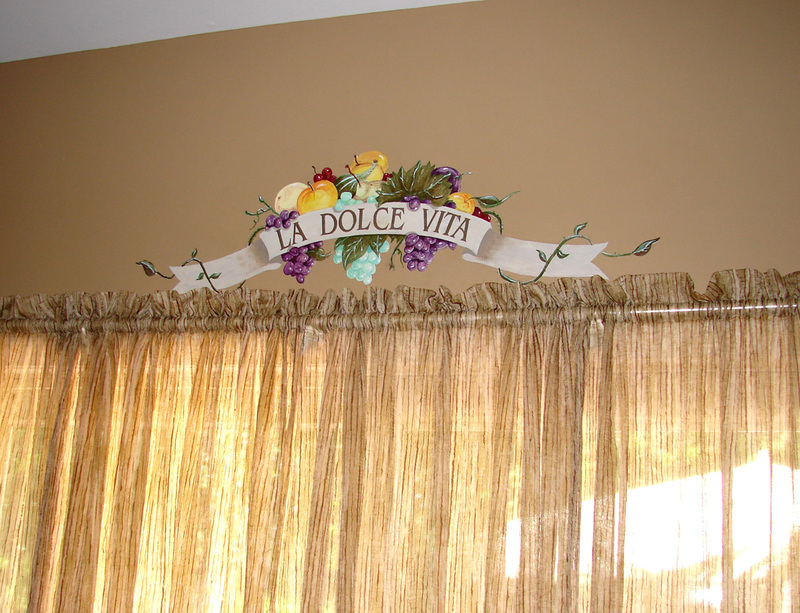 Hand painted Fruit Mural accented in this Kitchen Nook. 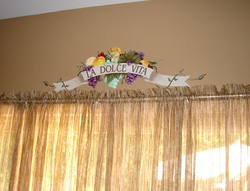 Detail of hand painted Fruit Mural on Kitchen wall. Detailed view of Villaggio Ristorante showing a warm brown faux suede finish. 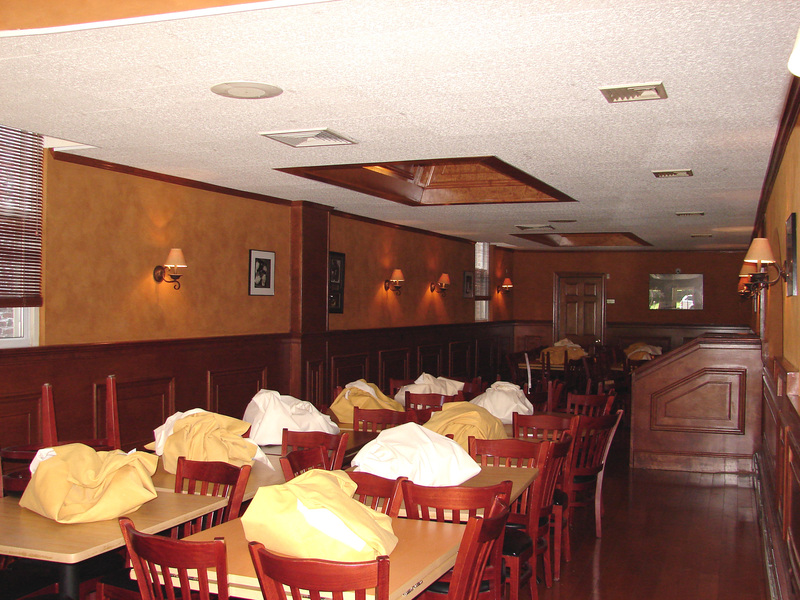 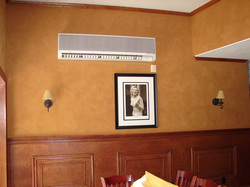 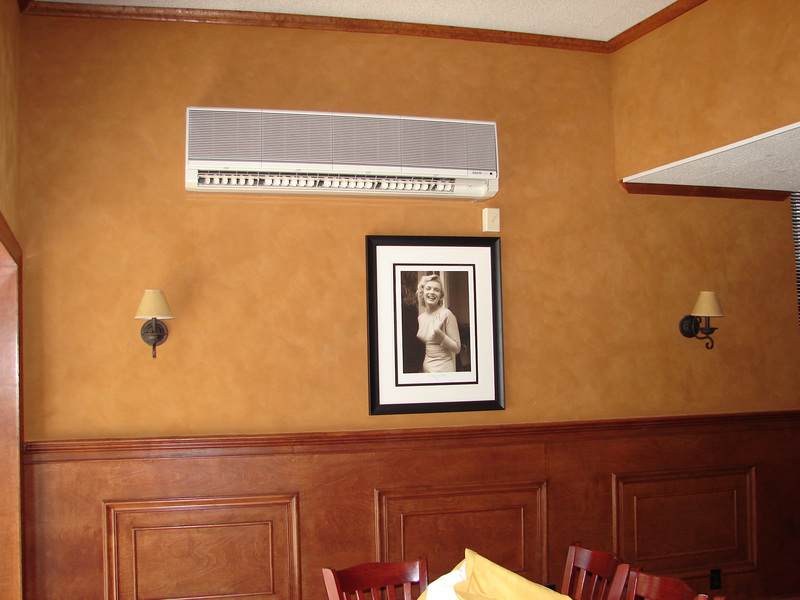 This large faux suede project makes this restaurant a warm and inviting space. 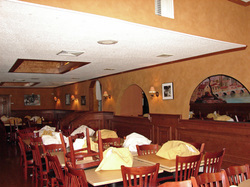 Villaggio Ristorante, located in Pelham, NY. 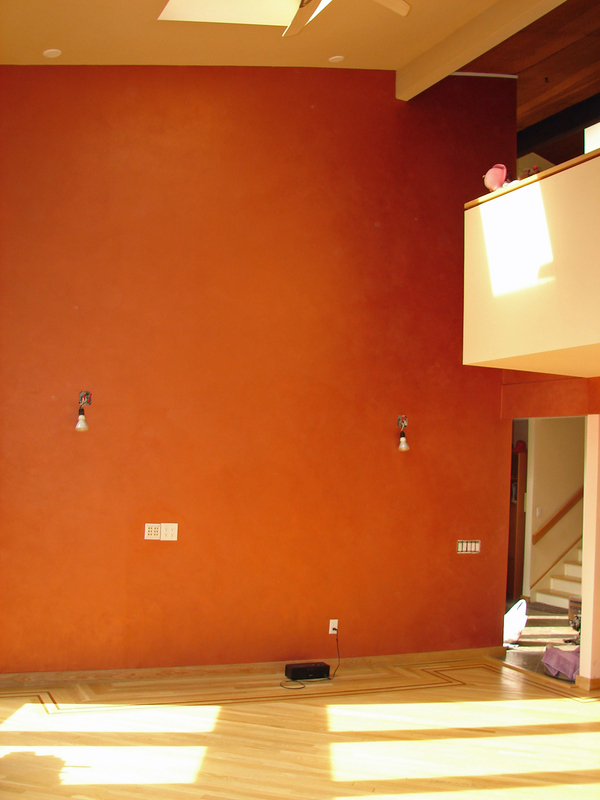 The walls in this large Family Room were executed using a 4 coat Copper Lusterstone finish. 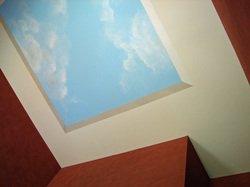 In this large Modern Contemporary home the ceilings were painted in a warm SepiaTan. 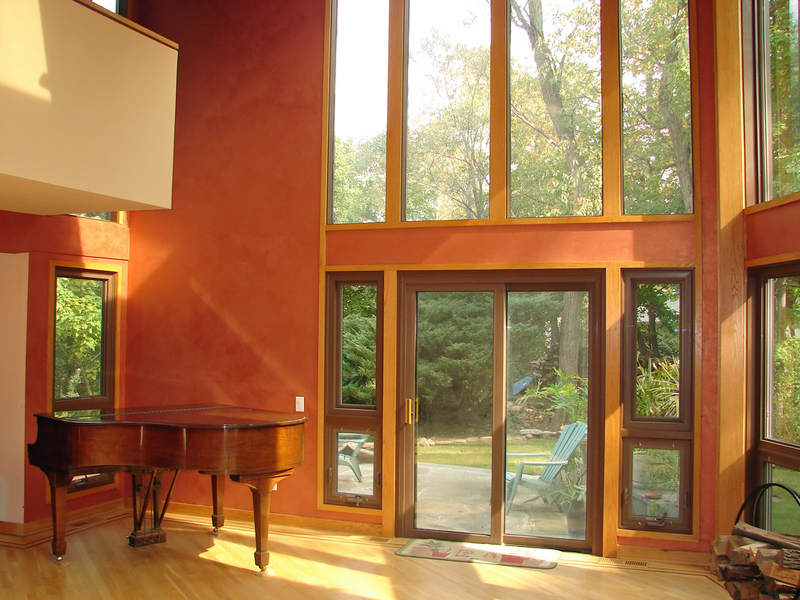 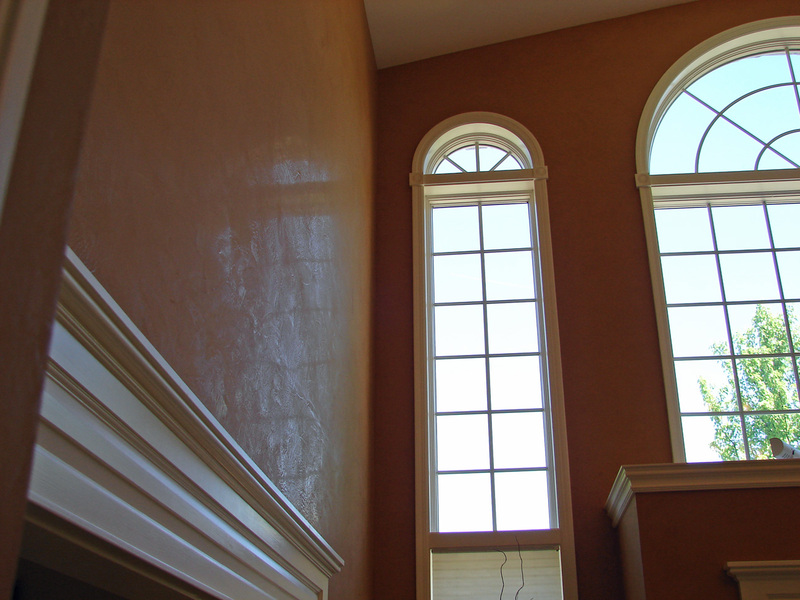 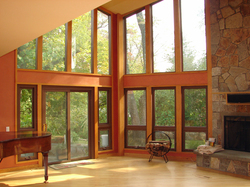 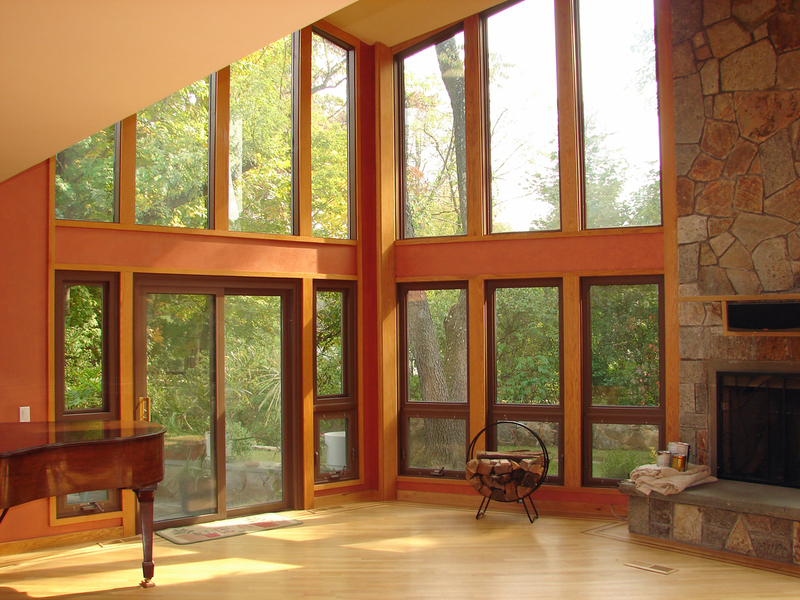 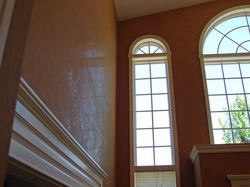 The window trim work was finished with a clearcoat polyurethane to bring out the natural beauty of the wood. A warm Cranberry Faux Suede Finish for the walls with a Sky/Cloud Mural on the ceiling area. Large wall showing detail of the Copper colored Lusterstone finish. 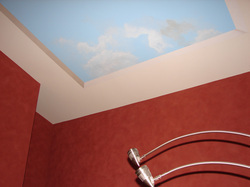 Detailed view of Sky/Cloud Mural.